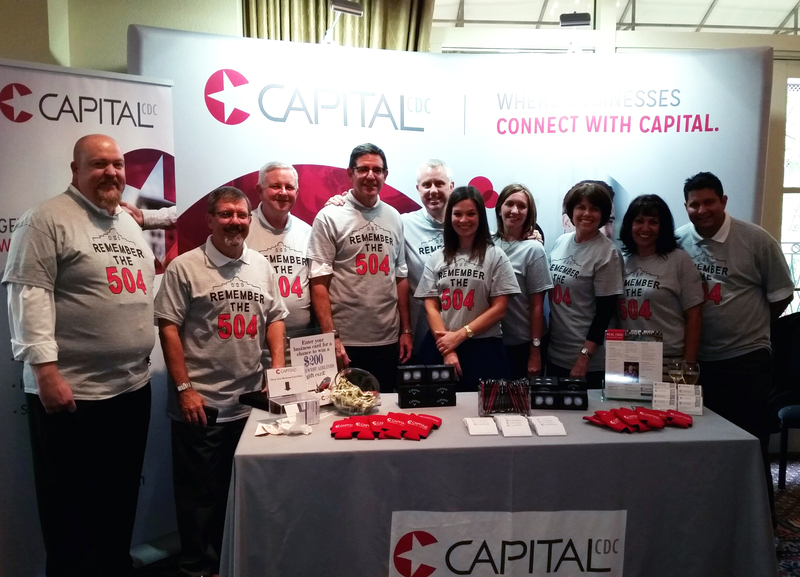 The 2014 Mid-America Lenders Conference, held in San Antonio, Texas was a huge success! Capital CDC participated as a conference exhibitor and participated in many of the conference functions. Our team was able to meet and speak with lenders from Region 6, the 5-state region comprised of Texas, New Mexico, Oklahoma, Louisiana, & Arkansas, and other exhibiting vendors. During the conference awards ceremony, Capital CDC was recognized as the Top 504 Volume Lender in both the Lubbock (West Texas) and Houston Districts. Congratulations to all of the lending institutions and individuals recognized at the conference! In an effort to promote the use of the SBA 504 Loan Program, Capital CDC rolled out a "REMEMBER THE 504" campaign during the conference. Because the conference was hosted in San Antonio, we wanted to have the shirt play off the city's history (so why not the most famous landmark, the Alamo?!). Here's your Texas history lesson for the week: the battle cry "Remember the Alamo" was shouted to remember the heroic struggle against impossible odds and the lives lost at the Alamo. We couldn't be happier with the positive feedback we received from everyone at the conference regarding the t-shirts! Thank you to everyone who stopped by our booth to pick up a shirt and wore them at MALC. Your support does not go unnoticed! Lastly, we would like to thank everyone at CTAGGL (Central Texas Association of Government Guaranteed Lenders) for planning and executing a successful event. You guys nailed it! We look forward to seeing everyone again at next year's Mid-America Lenders Conference.